Dan D. Farcas was born in Reşiţa, Romania, on April 1, 1940. He is married and has one adult daughter. He graduated in mathematics and physics (University of Timişoara, 1960) and obtained a doctor’s degree (PhD) in mathematics (the University of Bucharest, 1979). He followed IBM courses in data processing and M.I.S. in Bucharest (1968), Paris (1969), Bonn (1971), as well as other courses in: demography, mathematical modeling, data processing etc. Since 1962 he is working as computer analyst, programmer, trainer, consultant and manager of great IT projects in Romania. He was in leading positions in the Romanian Institute of Management (IROMA) and at the National Center for Health Statistics (NCHS) of Ministry of Health Romania. He is Member of the Romanian Academy of Medical Sciences (since 1991) and vice-president of the Romanian Society of Medical Informatics (since 1991). He is still active in NCHS as a consultant in eHealth. With the mother tongue Romanian, he is good in English, French, and Hungarian but understands some basics of other European languages, including Russian, German and Italian. Since 1971 he has published 20 books, all in Romanian, half of them about computers, mathematical modeling, popular science and the other half about UFOs. 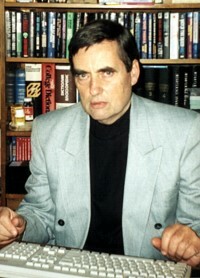 Initially he was interested only in extraterrestrial supercivilizations (see his opinion at http://www.asfan.ro/supercivilizations_and_the_extraterrestrial_hypothesis.htm), but writing his book “Why are silent the Extraterrestrial civilizations” (1983), he was stressed by the statistical relevance of the UFO phenomenon and became interested in it. After 1990 he has published several books including digests and comments on the foreign (mainly American, English and French) UFO literature, with an emphasize on three topics: abductions, spiritual and religious issues, military and political ones. He also published up to 7-800 articles and had tens of radio and TV presentations on the same topics. He made only accidentally field investigations, as in the Certesti CEIII case (see at http://asfan.home.ro/a_close_encounter_of_third_kind_in_romania.htm). Since 1998 he has been vice-president of the Association for the Study of Unidentified Aerospace Phenomena (ASFAN) and he has been active with the editorial board of the European Journal of UFO and Abduction Studies (2000-2003).